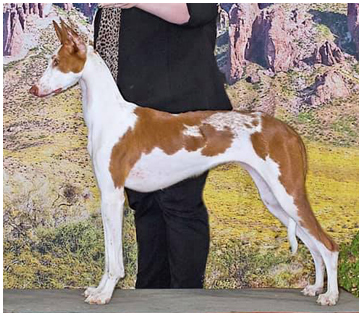 Sky is from the Winter 2017 "Desert" litter between Maestro and Fancy which was co-bred with and whelped by Nichole Bartlett of Enzo Great Danes & Ibizans. She lives in Arizona with Jenn, her family, and her other Abbaio Ibizan "Breeze". Sky has done very well with Jenn and Ethan and earned a Best of Breed from the classes and Best of Winners at a specialty on the way to finishing her championship with 4 majors at 15 months old!